Once you have enabled your Detailed Billing Report (DBR), you can enable the tags you will use with your cost reporting. This procedure will show you how to enable tags for your cost reports. Login to the AWS Billing Console. You can also login to the AWS Management Console, go to the menu bar and right-click your account name, and select My Billing Dashboard from the fly-out menu. From the Dashboard, click Preferences. Scroll down to the Report section, and click the Manage report tags link under the report list. Select the tag keys you want added to the Cost Allocation report. Click Activate to enable the selected tags and save those preferences. 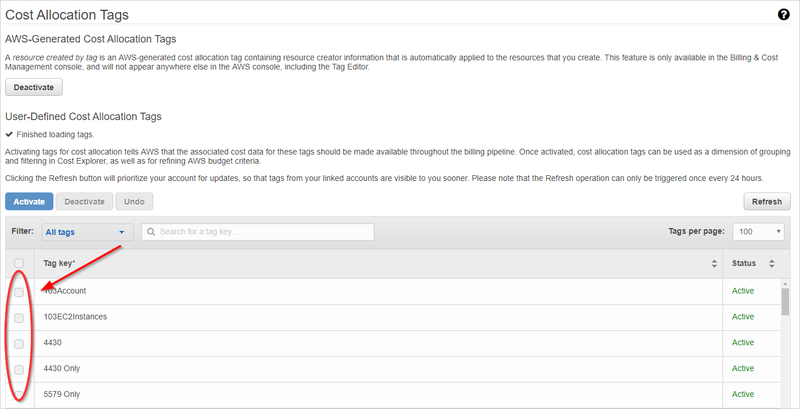 It can take a few days for AWS to add the tag costs to your billing reports. Once they are available in AWS, CloudCheckr will use the data to build your cost reports.